Or borrow with your monthly Prime borrow! to be directed to your country’s Amazon store. Deacon Garrison sees ghosts. He does his best to ignore them. Walks right through them and goes on with his day. Ghosts make his life a living hell. He criss-crosses the country in his vintage Airstream camper, blaring classic rock, and running from them. But this ghost is attached to his best friend Wade, a guy who’s closer to Deacon than family. So now Deacon’s got to throw down with the supernatural. He’s got to face his fears, dig deep, and find a way to fight. Because no matter what these ghosts fling at him, no matter how hungry and evil they are, messing with Deacon’s best friend is not an option. 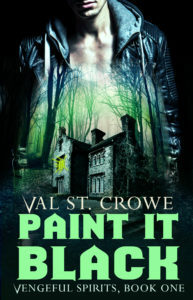 You might like this ghost-hunting urban fantasy if you like Supernatural. Or if you wish Ellie Jordan was as edgy as Jenny Pox. Or if you like your vengeful spirits with a hefty side of hard drinking and sarcasm.